The old Kvanchkara factory: At the Yalta Conference in 1945 Stalin, Roosevelt and Churchill drank "Khvanchkara" with the greatest pleasure. But beware: You might feel ..let say extraordinary after a taste. ONE SLOW SUNDAY I, Badri and Leo found out that we should go to Ambrolauri to inspect the piece of wine land they own together. It's nothing to see, really, because none of them have time or energy to grow grapes. What is special with this piece of land is that it has the potential for growing Andksandrouli, Tetra and Mojuretuli grapes, the basis for among others, the famous Kvanchkara wine. Anyway, what so often happens in Georgia, is that you meet someone by incident and things starting to happen. And many times goes out of control. I wanted to take a photo of Leo and Badri in front of their deserted vineyard, and became aware of a beautiful wine yard nearby. I needed some great shots of a proper wine yard, so I walked a couple of hundred meters down the road. There I met Bejani Chelidze, the owner. My companions explained to him what was going on, and he just become a big smile, jumped in the car with us and took us to his farm for more conversations. It was a proper occasion for tasting his wine, the Kvanchkara. And with wine comes food, and with food and wine it always becomes a Georgian party. Then he called the heads of the two wine factories in the Ambrolauri district, and asked them to open the factories for an extensive tour with tasting of all their brands. To my big surprise the managers agreed, and we were in for a real treat! 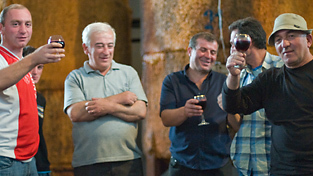 The story of the highly praised Kvanchkara wine is long. It has received a significant number of awards. It is manufactured on the basis of the Aleksandrouli grape growing along the Rioni river. There it grows at an altitude at 7-800 meters above sea level in a warm and humid climate. Average annual temperature is +10 to -11 degrees C and annual precipitation is 1000-1300 mm. This kind of conditions is optimal for producing high quality grapes. 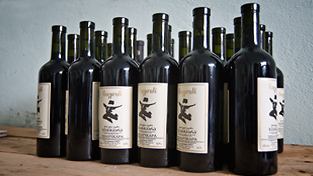 The production facilities are small farms along Rioni with an annual production around 1-10 ton a year of grapes. 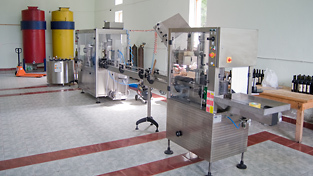 There are two main factories processing 150 ton grapes each year, and from those factories brands like Kvanchkara, Tetra, Barkoni and Alexandrouli are distributed into the market. "The Khvanchkara wine is characterized by highly developed species bouquet, rich taste with raspberries tones. It is dark lilac. Ready wine contains 10-12% of alcohol, 3-5% of sugar and 5-7gr/l. titrated acidity. 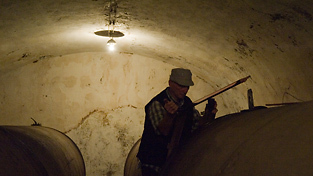 The wine of "Khvanchkara" for the first time was produced by the Georgian Prince Kipiani in the 70s" of the XIX century and it was called "Kipiani s wine". This is produced with the grape species of "Alexandreuli" and "Mujuretuli" growing only on the limestone soil of Ambrolauri Region. 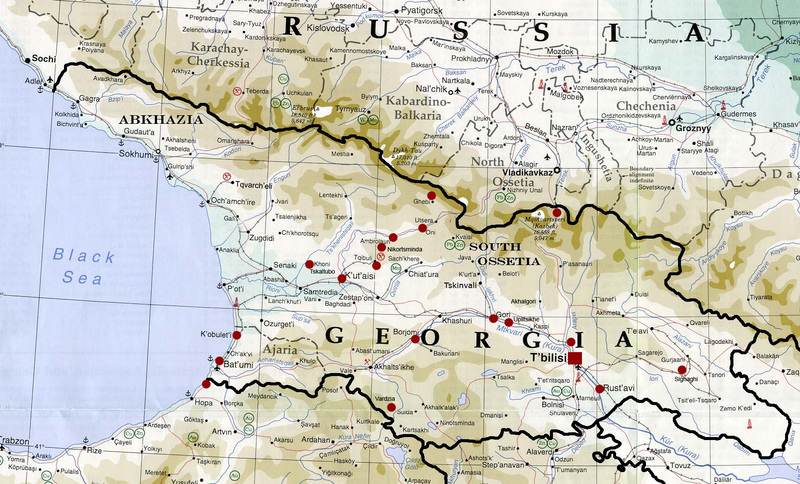 The technologist of wine "Khvanchkara" is the nature of the given Region itself. The changes in the air temperature during the period of grape ripening guarantee producing naturally semi-sweet pure wine. At the exhibition in Belgium in 1907 the wine "Khvanchkara" was awarded with a Grand Gold Medal and with the Medal with the image of Leopold, King of Belgium. In 1945, at Yalta Conference held in Crimea Stalin, Roosevelt and Churchill drank the wine of "Khvanchkara" with greatest pleasure"(Aleksandreuli LtD website). 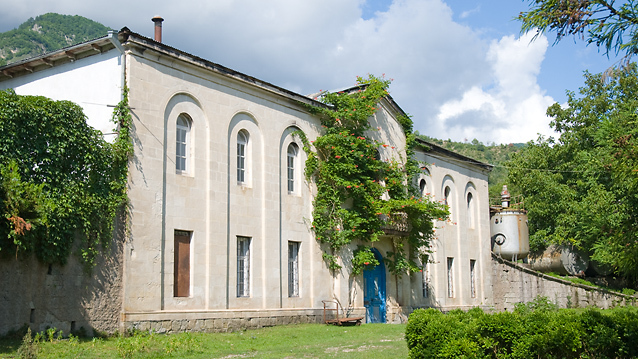 The oldest factory in Racha is from 1927. The wine is stored in huge barrels very cool in the basement. To be down there was like being innside a vault with treasures from angient times. The facility has a potentioal for processing about 100 tons of grapes annually. The second factory, the Bugeoli plant owned by Aleksandreuli LtD is hypermodern and was built in 2009. It uses the latest technology and equipment, and processes 50 tons of grapes a year. 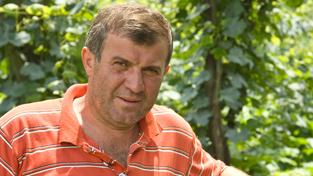 Wine yard owner Bejani Chiladze wants to stress that there is a need for investors in order to keep up production, and even increase it. He can be reached at his telephone numbers: +995 893 27 20 73 or +995 899 30 34 00. For more information about these wines and the Aleksandreuli companys Bugeouli plant in Racha can be found on their website. Bejani Chelidze, our most valued host and guide. The brand new french productionline, Bugeuli plant. Wine tasting in the Bugeuli plant. Sampling from the barrel on the old Khvanchkara plant.